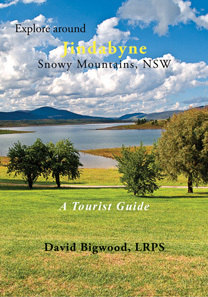 Explore Around Jindabyne. Jindabyne provides accommodation at all levels and is ideally located for the Kosciuszko National Park and the ski resorts at Perisher, Guthega and Thredbo. It is also ideally placed for the exploration of the many interesting and historic areas that abound in the mountains. Whether your interests are winter sports, bushwalking, fishing, horse riding, photography or just relaxing in the fresh mountain air with first class eating places on hand then Jindabyne can cater for you. It is also the home of the National Parks and Wildlife Service Visitors Centre which houses many valuable resources for tourists. And, it is a great place from which to explore the Snowy Mountains region. This book shows some of the many attractions to visit especially outside the snow season (during winter some roads are closed by the weather). It is also available as a print book for $A10.00 postage within Australia included. Overseas customers please use the form under the ‘Contact’ tab to ask for details.